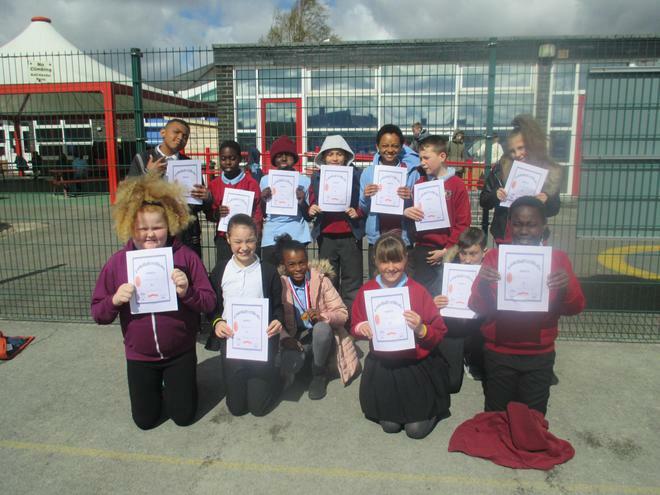 On Wednesday 27th April, the Year 5/6 Basketball team competed in the finals of the City CVL Competition, after finishing joint top of their league after two rounds of league matches. Facing off against some very tough opposition the team managed to place a very credible 5th place, after drawing their first game 2-2 against Middleton, losing narrowly 10-6 to Heathfield, but finishing strongly with a convincing 14-2 victory over Brocklewood. Some excellent individual and team play was on show across all three evenings of competition. A special mention goes to Cyanne from Outstanding Oaks who stepped in at the last minute to replace an injured member of the team and scored three baskets in her first ever round of matches! A fantastic achievement for a Year 4 pupil playing two years above her age group. for his contribution across all three evenings culminating in a fantastic long shot that sailed straight into the basket! A very big thank you to all parents and carers who helped with transport and supported our children.